Iina our guide was ready and waiting as we returned from breakfast at 0930. 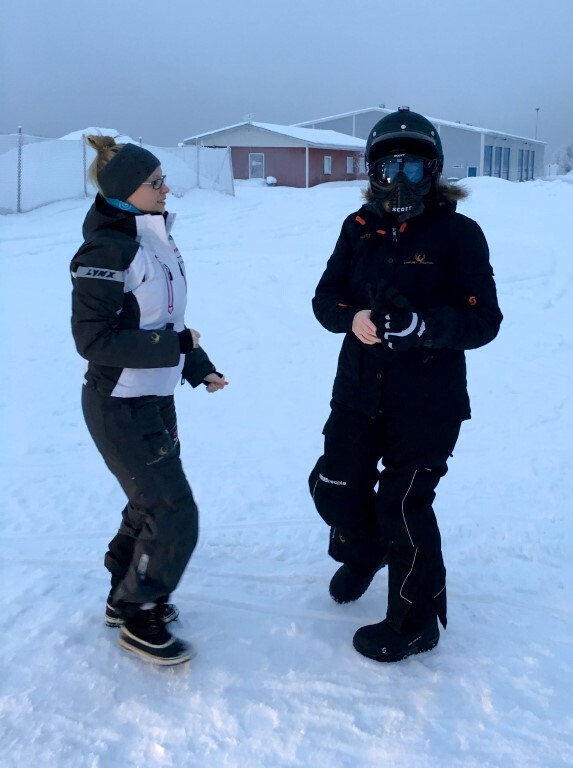 As we did the one hour drive to the Luxury Action offices by the airport it was only -5’C, considerably warmer than yesterday’s -23.5’C. In a very warm basement we are kitted out with helmet, boots, pants, jackets and gloves. 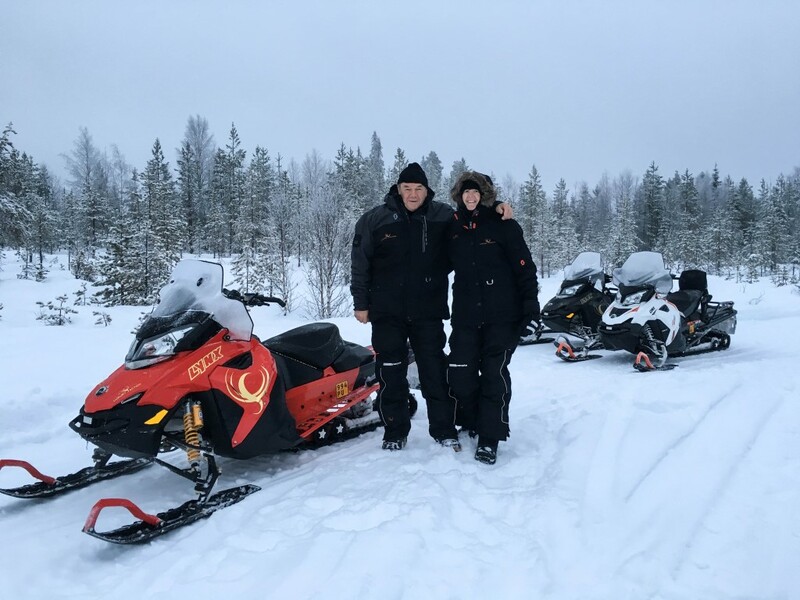 A short drive and we arrive at the 3 snowmobiles (skidoos) for a quick brief on driving, which pointed out the go and stop devices and hand warmer settings for the handle bars, followed by “don’t pass me” and we were on the move. We headed off up a track into the forest quite slowly for a start. We stopped so Iina could check we were ok, then set off a little faster. There are a maze of different tracks in this forest. 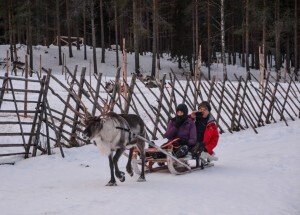 They have separate tracks for skiers, dog and reindeer sleds and snowmobiles. There are stop, give way and speed limit signs. We covered lots of ground over the next five hours including stopping for a nice lunch (warm beetroot soup) in front of an open fire in an open hut on a hill. As the day went on we got to go a little faster, hitting 90kph at one stage. Apparently in the racing world these machines get driven at 200kph. Around 3pm the big blue appeared (the sky turns a hazy blue colour) then it was dark. We got to head off road and have a play in the fresh snow. Opening the machine out I was surprised by a mound that briefly launched the machine into the air. It’s almost eerie how quiet it is around here. The snow and the trees have an amazing dampening effect to the point that you can’t hear other machines coming until they are within a few metres. 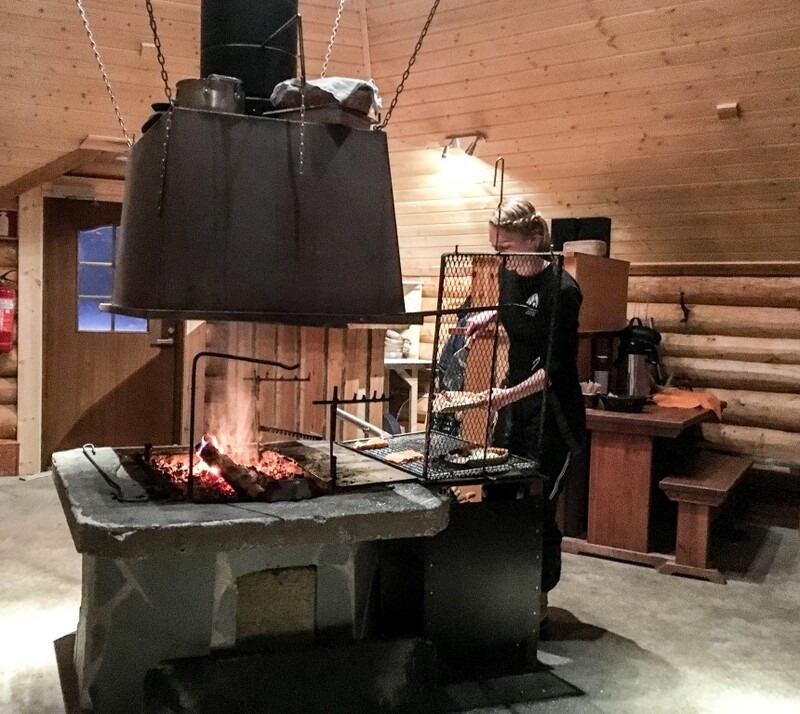 After packing up and handing in our gear Iina drove us the hour journey back to Beana Laponia where we enjoyed a xmas eve dinner of reindeer meat, vegetables and lots of other nice food. Iina, our guide, has really impressed us, not only with her punctuality and great personality but also with her willingness to share information on the local district and her endless enthusiasm, ensuring we have a great time. We woke very early again this morning and made calls back to NZ to wish various family members a wonderful Christmas. It was +2’C outside and raining, very unseasonable weather here. We had originally planned to go tobogganing on the slope out the back of the hotel but with the poor weather decided instead to relax indoors until our 1pm pick up for the one-hour drive to our accommodation for the night at the Arctic Snow Hotel and Igloos. 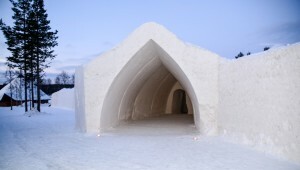 The Arctic Snow Hotel is built each year at the beginning of November. They make snow as there is not enough natural fall by then, and compress and mould it into shape. In the hotel are a number of basic rooms, some decorated suites, a chapel, a restaurant and a bar, all made out of snow and ice. The beds are made in ice frames with a mattress covered with reindeer skins. 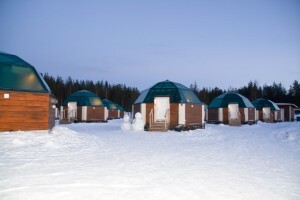 The inside temperature is between -3’ and -8’C. 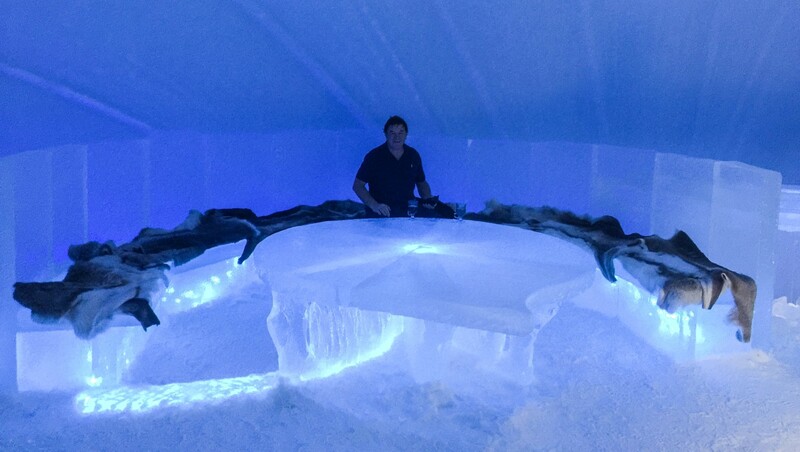 The suites are all decorated with different ice carvings with coloured lights built in behind the ice for accents. The basic rooms are pretty austere – just square rooms with beds. 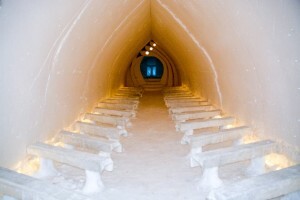 The chapel is quite lovely although the seats look pretty cold. More on the restaurant and bar later. It is quite an interesting property and definitely something different but unfortunately they have missed the service aspect a bit and it feels very much like a production line affair. We checked in, received details of our bookings for the afternoon, dropped our bags in our glass-domed-igloo and headed off for lunch in the kgotla, a traditional high-roofed kitchen area. A lovely young woman served us delicious salmon, cooked over the open fire, followed by apple cake with vanilla sauce. At 4pm we headed off to our traditional Finnish sauna, hot tub and snow sauna experience. This was great! After spending time in the “normal” sauna, we headed outside (in our flimsy spa slippers) and climbed up some snow steps to a hot tub on top of a snow building. After soaking a while it was time for the snow sauna. This really was an experience. We entered a fairly small room entirely built out of snow with wooden benches on each side and a big plastic bin thingy at one end. It turned out this was the “sauna heater”. Once the door was closed we ladled water on to the heater and the room filled with steam, instantly warming us… and totally blinding us… and then the ice started melting and dripping on us… quite a sensation. It cooled quite quickly and then the whole process was repeated. We were only allowed to stay in for 10 minutes before they had to shut it down to refreeze. Apparently about 3mm of ice melts each time. 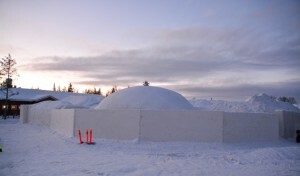 They can use the snow sauna about 70 times before it is done so they are always building new ones. We finished off back in the traditional sauna and were toasty warm at the end of our hour-and-a-half total experience. Next stop was the ice bar – smack bang in the middle of the Snow Hotel. With great mood lighting, a large ice table, reindeer skin covered seats and ice shot glasses it is quite a stunning room. Neither of us was really in the mood for shots so we enjoyed a couple of hot drinks instead. 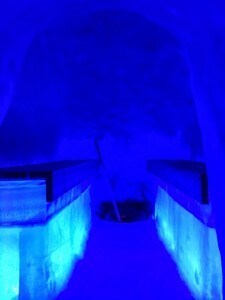 At 7pm we headed over to the ice restaurant for dinner. It is not often you eat dinner rugged up in multiple layers including hat and gloves but necessary here. 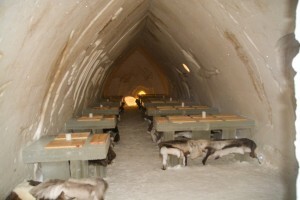 The restaurant consists of three chambers each with about 10 ice tables with reindeer skin covered bench seating. Wooden blocks are screwed into the ice – acting as insulating placemats. A three course meal is served reasonably quickly. The food is obviously cooked somewhere else and reheated in the back but was warm and tasty. 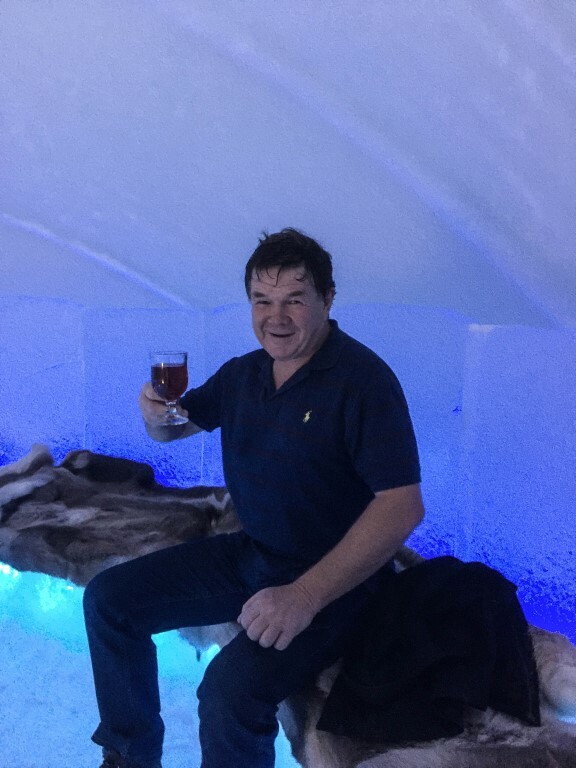 After dinner we retired to our glass igloo for the night. The igloo is fairly basic but warm and comfortable. There is even an alarm to wake you if the northern lights come on. All in all a pretty good Christmas day. Iina was there to pick us up early. We drove to a local reindeer farm. SieriPoro farm (all 10 hectares of it) has been in the same family for 500 years. 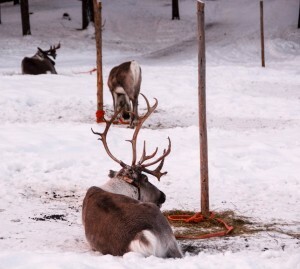 They run around 200 reindeer. In the summer they are let loose in the forests. A number of them have bells and a few have GPS trackers to help the herders locate and return them to the farm in the autumn where they are held for the harsh winter. We fed nuts out to a mob of young deer before heading of for the sleigh lesson. A paddock held about 20 stags, each tethered to a pole. The stags without antlers were in poor condition having just come through the rut. 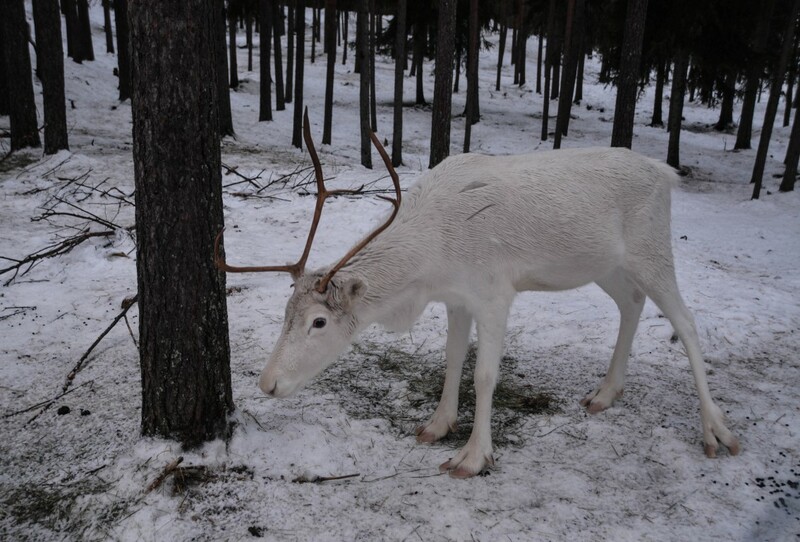 The castrated males still have antlers and will for a while longer. 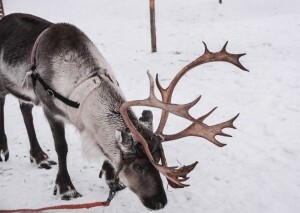 Tervi, a castrated stag, is lead from the paddock and a sleigh is attached. I sit at the back and Sylvia in front of me. The herder hands the single reign to Sylvia and off we go. The first lap of the 400 odd meter track is done almost at a gallop, the second a little slower. 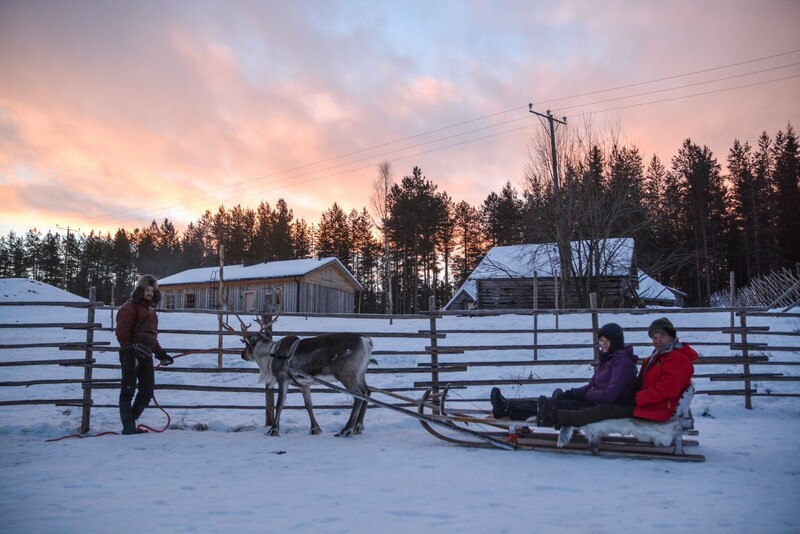 It takes four years to train a sled deer. They have a green ear tag so if they get killed on the road the insurance company pays out extra for these skilled beasts. Apparently about 400 reindeer a year get killed by cars and trucks. We pay a visit to a paddock of hinds one of which is white. Next we enter a shed with a moss roof and partly dug into the ground. A fire graces the middle of the room which is very warm. A lunch of reindeer stew and potatoes, all home grown, is very tasty. The owner tells us how his father turned the farm into a tourist business in the early 90s when times got tough. All the buildings are built from trees felled on the farm. The owner and the two herders we chatted to were really friendly and helpful. 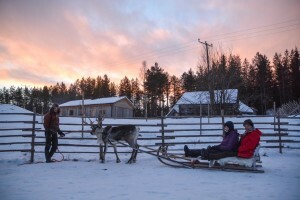 We finished the visit with the purchase of a couple of reindeer skins. 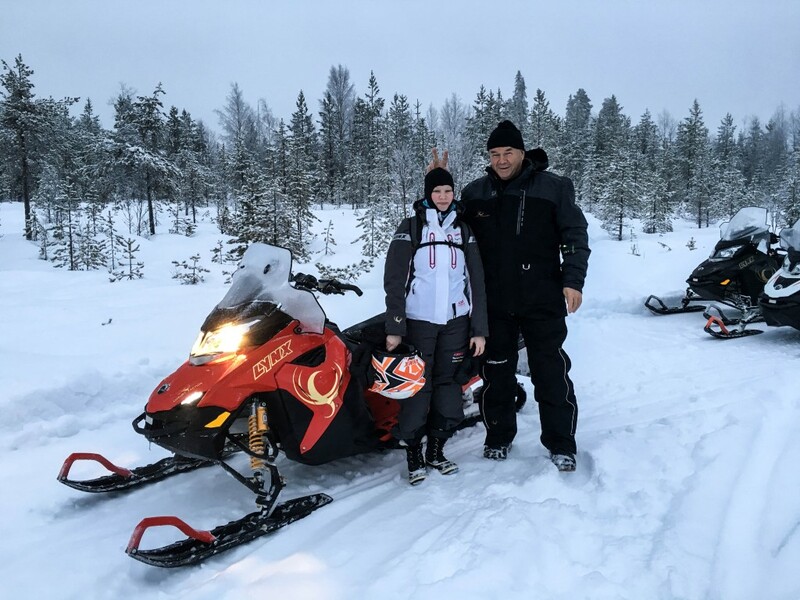 We headed to Iina’s office to drop the skins off in time to see a fairly large Russian-made private jet pull up, apparently carrying some Victoria’s Secrets model and family who will be Iina’s guests tomorrow. The local museum, Arctikum, had an excellent exhibition on the arctic and another on the history of the local area. The city of Rovaniemi was 90% destroyed by the Germans when they withdrew to the north in late 1944. For a reason unknown to me we had to leave hurriedly just before 3pm. We headed down a back road arriving at what in the summer may have been a paddock. There is a racy looking car parked at the edge of it. Sylvia had organised a surprise for me. 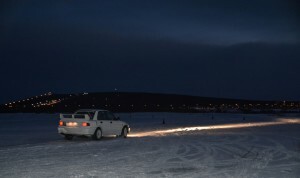 I hopped in the passenger’s seat while the instructor, a retired rally driver, took me for a spin around the ice track. He explained how normally they did this on the river but with the rain and warm winter the ice was not up to it yet. They had iced up the paddock by spraying lots of water on it. Tyres here at this time of year all have studs in them. They make a huge difference in holding the car on track. Next it was my turn in the driver’s seat. 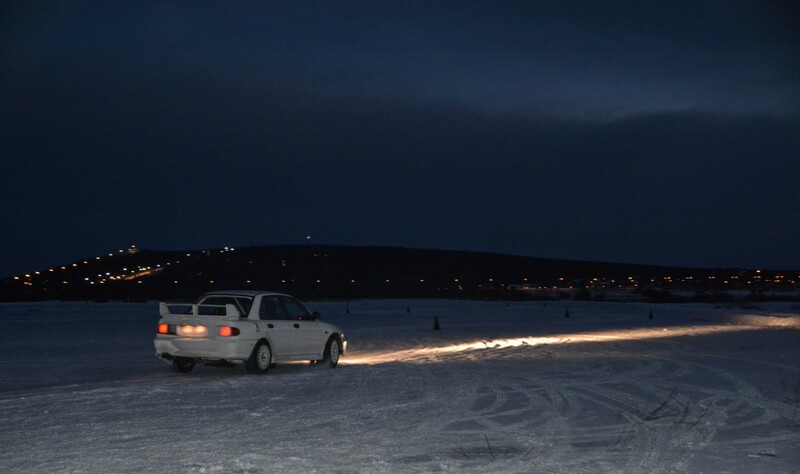 The next 30 minutes was a lot of fun, drifting the car from side to side to line up the many sets of cones on the course. The driving over we headed back to Iina’s office to get changed into shorts and t shirt ready for the flight to the Maldives.